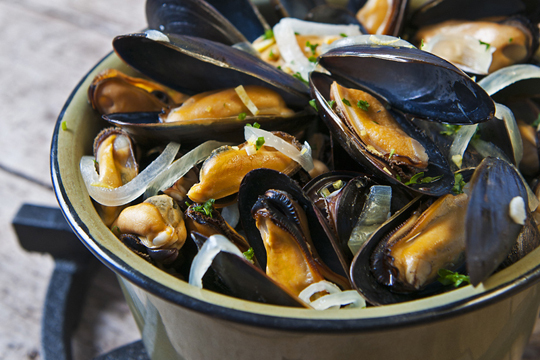 In a large frying pan, fry the mussels until open. Discard any unopened mussels. In another frying pan, sauté the mushrooms in butter. Drain mussels and keep the cooking juice. 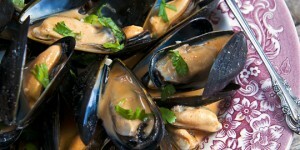 Remove the mussel meat from the shells and keep warm. Dissolve the flour with the white wine, the cooking juice and the juice of 1 lemon. Add mushrooms, parsley, basil and thyme. Thicken over medium heat stirring with a wooden spoon. Poor the mussel meat in the sauce and warm up for a few minutes over medium heat. Adjust spicing by adding some lemon juice from the second lemon if necessary.